AMSOIL Ea® Heavy-Duty Extended-Life Oil Filters (EaHD) provide excellent filtering efficiency and high levels of contaminant capacity for heavy-duty on- and off-road gasoline and diesel applications. They provide extended service intervals that coincide with the maximum drain interval recommendations of AMSOIL synthetic motor oils (not to exceed one year), increasing convenience and reducing maintenance costs. Ea® Heavy-Duty Oil Filters have lower restriction than conventional cellulose media filters. Their small synthetic fibers trap smaller particles and hold more contaminants, while providing better flow than cellulose media. During cold-temperature warm-up periods, an Ea® Heavy-Duty Oil Filter allows the oil to flow through the filter more easily than a typical cellulose filter. Lower restriction helps circulate oil more quickly, promoting long engine life. Ea® Heavy-Duty filters offer AMSOIL quality at competitive prices. Provide excellent filtering efficiency and high levels of contaminant capacity for heavy-duty on- and off-road gasoline and diesel applications. They provide extended service intervals that coincide with the maximum drain interval recommendations of AMSOIL synthetic motor oils (not to exceed one year). Efficiency refers to a filter’s ability to trap wear-causing contaminants and prevent them from circulating throughout the engine. Ea Heavy-Duty Extended-Life Oil Filters are engineered using full-synthetic media that provides a filtering efficiency of 98.7 percent at 20 microns in accordance with industry standard ISO 4548-12, ranking them among the most efficient available for heavy-duty applications. Increased efficiency helps reduce wear for long engine life. Reference AMSOIL Heavy-Duty Bypass Systems for even more contaminant-removing power. 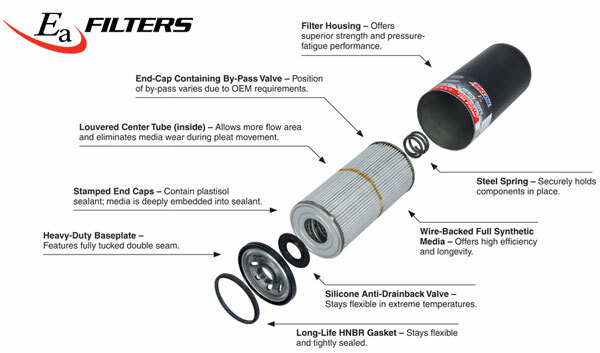 A filter’s capacity refers to the amount of contaminants it can hold and still remain operational. AMSOIL Ea Heavy-Duty Oil Filters have a high holding capacity for wear-causing contaminants. Over the service life of a conventional cellulose filter, hot oil can degrade the resins that bind the media. Ea Heavy-Duty Oil Filters’ full-synthetic media technology is resin-free. It uses a wire screen backing that is pleated with the media for superior strength. Ea Heavy-Duty Oil Filters are recommended for heavy-duty on- and off-road gasoline and diesel applications including, but not limited to, over-the-road trucks; dump trucks; refuse haulers; school buses; farm tractors; mining, construction and industrial equipment; and more. Popular manufacturers include Caterpillar, Peterbilt, Mack, Kenworth, John Deere, Ford and several others.